Marc Garrett: You are an artist who works solo and with others in various ways. A large body of your work consists of performances, interventions and sound recordings. I want to begin this interview by asking, why you decided to form ‘The NeoFuturist Collective‘, and what was the main mission or purpose behind such a collective? I invited a group of artists to join me in making a collaborative piece of work from a seemingly simple premise – the transformation of urban noise, inspired by futurist artist Luigi Russolo’s Art of Noises manifesto. Russolo had created a series of “noise networks” or symphonies for his mechanical intonarumori (noise makers) back in 1914, and in so doing he had influenced the entire course of 20th century music. Despite his contemporary resonance, little is generally known about Russolo’s work, as all of his instruments were destroyed in the intervening two world wars. Of the scores he wrote, only the first 7 bars remain of Awakening of a City, and that only because it was reprinted in the art magazine Lacerba. Apart from the fragment of written score there are letters, reviews, photographs and other forms of documentation which have led researchers and artists over the years to try and recreate his noise making instruments. Our project is rather different – we use the remaining 7 bars as the starting point for a new piece of work, ReAwakening of a City, engaging with all forms of visual and aural urban noise that we spend so much time trying to block out. Traffic noise, junk emails, health and safety warnings, advertising and street furniture. The form is performative, visual and mediated as well as musical, using all available means at the disposal of the 21st century artist. By engaging with my artist-collaborators’ practices, I commission work that responds to this central idea and then set up an appropriate curatorial context for extending that individual response into a collective noise network. MG: Where did these ReAwakening of a City events happen, and what kind of response did you receive when these performance, interventions took place? How important was it to connect with others – every day people, whilst engaging in the process of expressing these real-life experiments? JY: The first ReAwakening took place in Brighton in Feb 2008. We started off the project by declaiming the NeoFuturist manifesto (written by Rowena Easton) in Jubilee Square, with a bunch of workmen and their drills providing a fabulously appropriate accompaniment to the text which celebrates Urban NOISE. (The manifesto can be downloaded from http://www.neofuturist.org). 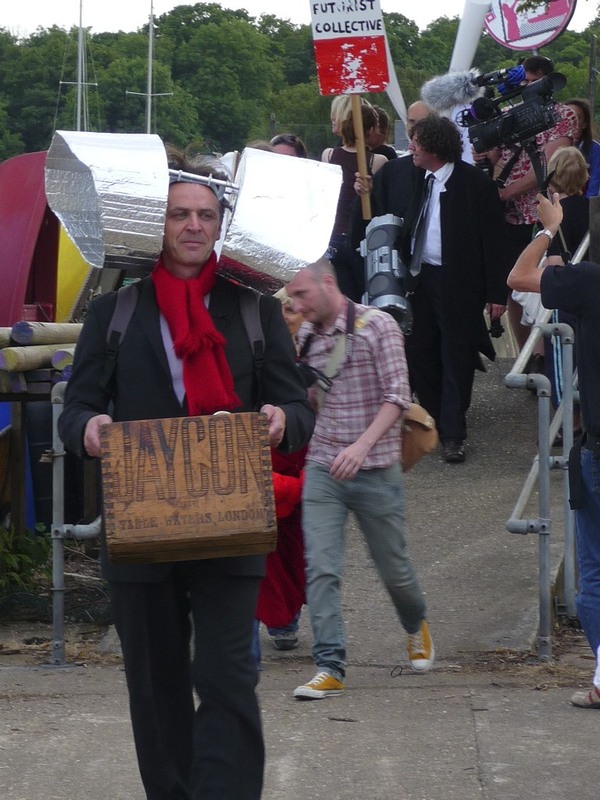 The crowd then followed us onto the Arts Council offices where we laid a wreath on their steps in support of all the companies that had been recently cut – we were ourselves in receipt of Arts Council funding at the time. A classic case of biting the hand that feeds you. Our activities provoked mild amusement and little controversy however, as the good citizens of Brighton & Hove are used to seeing “crazy” artists peddle their wares in public. A couple of months later we had our first performances of work-in-progress at The Basement, Brighton. The reaction here was far more hostile and interesting, with some audience members questioning our politics in the Q&A session afterwards, accusing us of proto- fascism. Actually the level of debate was thrilling, as we really touched people’s buttons and ended in a deep discussion about the impact of the Futurists and their relevance to the current political climate. This question surfaced again a few of months later in an online interview with The Thing Is… magazine. We were fortunate after that to be invited to make a piece of work on Wall Street in New York for the psychogeographic festival, Conflux. Our proposal was to make a walking performance that explored the everyday experience of living and working in the Wall Street district and how this might inform our understanding of the impact that this small area of real estate has on the rest of the planet. We arrived on September 11th 2008 to be met by 9/11 conspiracy theorists on street corners, and proceeded to spend several days mapping the area through sound recordings, text and video in preparation for a dawn performance on 14th September – a ReAwakening as the city awakes. The effect was dramatic and unexpected, as my declaration of the NeoFuturist manifesto outside 1 Wall Street brought about the collapse of Lehmann Brothers that weekend and the subsequent domino effect on the global economic system. Sorry world! Our next major intervention was more low key, but no less dramatic as we were commissioned by Fuse Medway festival to engage with and inspire the village community of Upnor. Our mission was to get the people to take to the streets in a protest/celebration march. We worked with the community over a number of months, holding public workshops and meetings, networking furiously in the local pub (one of four!) and it soon became clear that the general apathy towards the arts, and outsiders in general, meant that if the public were not going to come to us, then we would have to go to them. So we took to the streets and made work in public which enraged some, who questioned where our funding had come from, but delighted others and built a momentum towards our final performance. 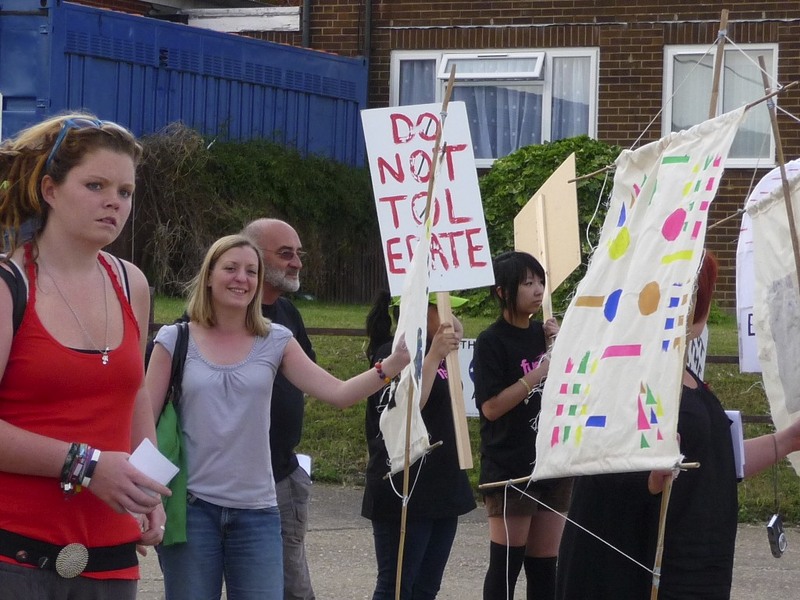 A Call to Arms (as the piece was finally called) took place in June last year and was a very successful example, I think, of how one can make “community art” challenging as well as accessible. See http://neofuturist.blogspot.com for full documentation and a film of the performance. Other pieces of work, include shouting at the Futurist paintings with a megaphone, as part of the Tate Modern Futurist retrospective last summer. An experience as liberating as it was faithful to the original spirit of futurism, causing equal anger and delight amongst an unsuspecting public. I was also invited as a panellist to take part in a public debate along with other luminaries from the art world, on the subject of “Is the Avant Garde Passe?” organised by The Institute of Ideas in London. Here the public paid to witness a lively and informed panel discussion around the relevance of contemporary art, proving, it seems to me, that there is a real appetite for intelligent, politically driven commentary and debate. A group of artists drawn from the fields of visual, performance, video and sound art will attempt to transform the everyday language of urban sounds and visual junk (such as spam emails and billboard advertising) into a true multi-media experience to do just that; asking us to question our assumptions about what is beautiful in a modern world of information overload. MG: Your comments that contemporary art is in need of intelligent, politically driven commentary and debate rings true. In respect of my own art context(s). Thinking of the many amazing self-organised, networked communities, of which there are many, on-line and in physical space; there has been a massive shift of art creating, moving independently, yet in parallel to the ‘official’ and hegemonic examples accepted or considered contemporary at the moment. Of course, if we think about what contemporary means itself, it means existing, occurring, or living at the same time. The relationship between institutions and art which is actively critical and more challenging than easier processed art such as Brit Art, how they represent contemporary art. With the understanding that there have been various influences, mutations and re-appropriations from the Fururist movement, I am wondering what elements you feel or think are still important to reclaim, reshape and reintroduce into a contemporary world, both in respect of the art arena and in relation to our everyday environments? JY: What interests me in relation to the Milan Futurists is, first of all, the misperception, as you have pointed out, that futurism was primarily a fascist movement. My understanding is that Marinetti was the only artist to have that association, having been invited to serve on the Central Fascist Party Council after the First World War. He resigned not long after as soon as the Catholic Church was also invited to sit on the Council – Marinetti being an avowed atheist. This is not to excuse the entire movement of this problematic association, but it does put it in context. It also recognises that a spirit of optimism and a belief in technological solutions to the world’s problems, that futurism embodied, also has its’ darker side. And it is with this knowledge that I choose to engage with (neo)futurist ideas in the 21st century, as it seems to me, that in a world seemingly on the verge of collapse, that a spirit of positivity renewal is both urgent and necessary, and also the ultimate political gesture. You mention various artist collectives that have appropriated the futurist legacy in this way, and to that I would add Ultra-Red who, incidentally, published a short sound piece of mine, recorded on Wall Street during the crash of 2008, as part of Fifteen Sounds of the War on the Poor vol.3. In order to engage with the state of the planet, artists can no longer cling to romantic, utopian notions of nature/beauty in opposition to man/technology. This dichotomy seems to represent more about human self-loathing than it does about a workable solution to global warming/terrorism/the energy crisis/reform of global capitalism, etc. Moreover it leads us towards a new “medievalism” (ban air travel, ban cars, buy local) that is all too prevalent in ecological pressure groups. In this argument, man has brought us to the edge of destruction, therefore we must drastically scale back all of our wealth-producing activities. As if the (post)modern world could be wished away in either a Luddite vision of the future or more worryingly in the ideology of The Zeitgeist Movement, whose apocalyptic vision of a radical eco-future involves tearing down our cities and rebuilding them. In this breathtaking philosophical leap, Krause removes the human from the natural environment and pits him/her in opposition to it. In creating a separate category for human sound activities outside of the biophony (i.e. the sounds of all other species on the planet), he is both over-stating human control and dominance over the environment and also denying us a role in the Gaia hypothesis – one of the green movement’s central texts, that views the Earth (and all of its inhabitants) as a single organism. If, as I believe, we can find beauty within the drone (our drone), then the clamour of urban noise, both visual and aural, can be transformed in our perceptions into something of interest and value, rather a thing to be blocked out or ignored. If we can stand in a busy place such as Oxford Circus in the centre of London and open our ears to the sonic detail that is contained within the omnipresent drone of human activity, then we can begin to understand that activity as a creative, as well as a destructive, force. We can then harness and use this energy to power and revitalise the human spirit. So, for me, the Art of Noises manifesto is the central and critical text in beginning to shape a new understanding of the contemporary sound and land-scape. If we can find a way of reframing urban noise as a meditative experience, as I recently did in my residency with Blast Theory, then we are part of the way to ReAwakening our cities as places of hope and optimism. To do this, I made a number of immersive binaural recordings of the area around 20 Wellington Road, where Blast Theory are based on the industrial outskirts of Brighton, and mediated these as iPod listening experiences in a temporary installation space that I set up for the event. When I came to retrieve participants from the room (they went in 4 at a time) they had invariably made themselves comfortable and been totally immersed in the sounds of the local traffic. They often described their experiences as “relaxing” and “enjoyable”, and how many times can you say that of the experience of standing beside a busy, urban, traffic-filled road? So that is my mission for ReAwakening of a City; to take Russolo’s lead from the surviving 7 bars of his score to Awakening of a City (1914) and reframe and rework the paradigm of the celebration of urban noise to (re)awaken of all of the senses through a heightened perceptual shift in one of them – that of hearing; the neglected sensory cousin in our predominately visual culture. My ultimate ambition being to create a large-scale performance event for the 100th anniversary celebrations in 2014, in collaboration with like-minded artists from around the globe.